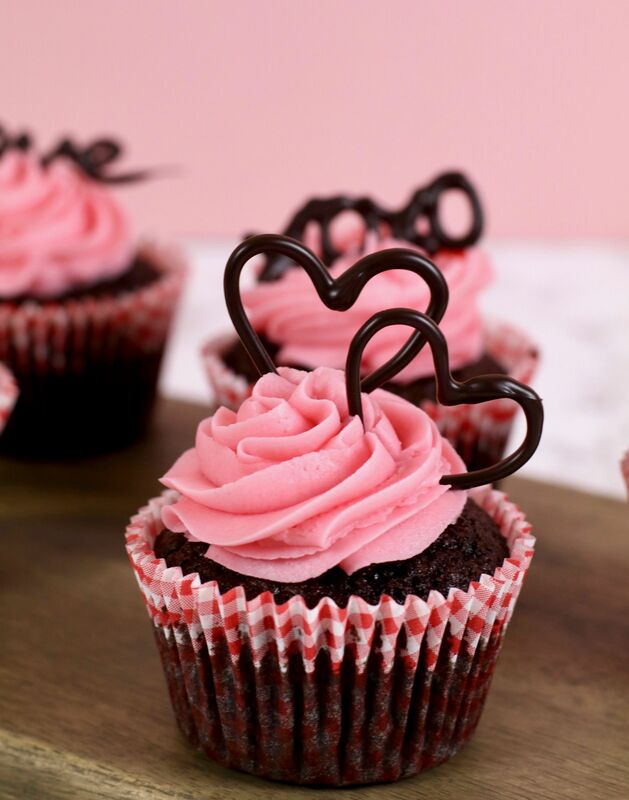 Whether you love Valentine’s day or hate it, I’m sure we can all agreed that although it can be over-commerciased there can be some great treats popping up at your local bakery. As I said in my Valentine’s day gift guide Valentine’s day doesn’t just have to celebrate that special someone. It can also be a time where you celebrate, or let someone know that their friendship is appreciated. And what says ‘thanks for being the best’? CUPCAKES! Or anything edible really. Am I right? So, how do you make these morsels of tasty goodness? 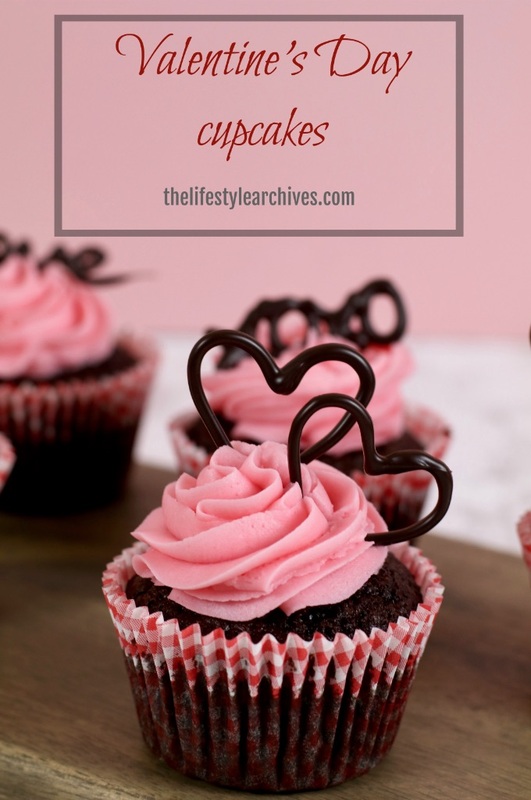 You can use whatever cupcake recipe you prefer to use and however you like to make buttercream. 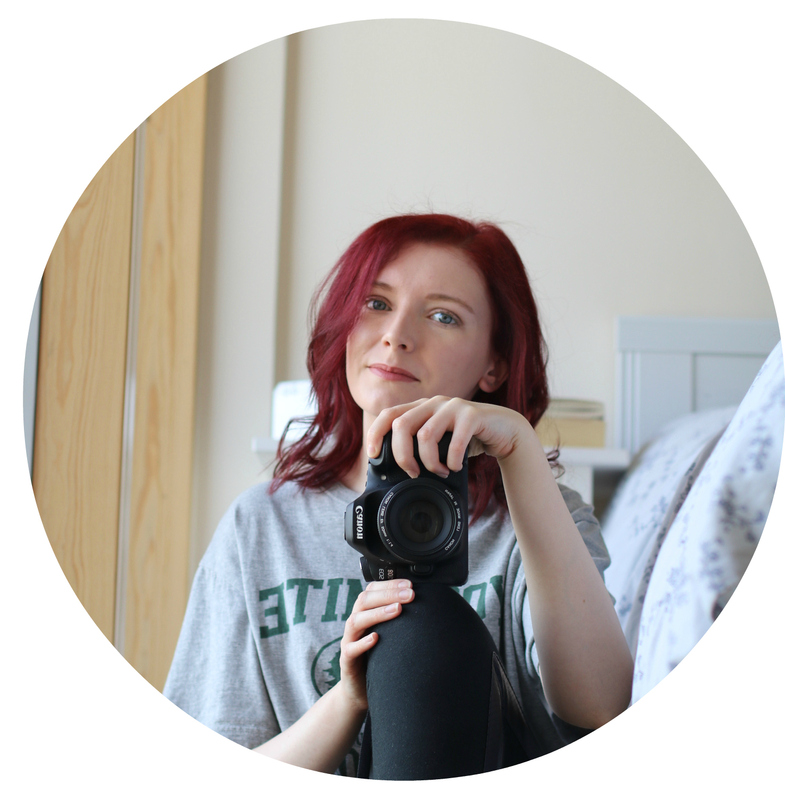 I decided to go for the typical chocolate cake and pink icing because it literally screams Valentine’s day and that’s exactly what I’m after for a Valentine’s day post, but it would work well whatever you choose. Originally I wanted to add chocolate covered strawberries on top, but alas strawberry season is not here and the ones they have in the supermarkets do not look overly appealing. So instead I decided on simple chocolate designs that are actually quite easy to do. Firstly you need to melt the chocolate. You can do this either via the microwave or bowl in saucepan over simmering water method – whichever is easiest for you. However you need to make sure the chocolate has completely melted. After this you would take your bowl of melted chocolate off/away from the heat and allow it to cool for 15-25 minutes (depending on how warm your kitchen is), so that the chocolate does not run when piping it, but not so cool that it starts to harden in the bowl. Top tip: stir the chocolate occasionally to see how it is and to help it cool down. Once your chocolate has rested prep the piping bag. As there’s not much chocolate I cut the piping bag down so it was 1/3 of the size it originally was – this makes it easier to pipe smaller amounts. After snipping off the end and inserting the nozzle you should place the piping bag over a mug/glass so it makes it easier to pour in the melted chocolate. Make sure the nozzle is folded over so no chocolate can escape. Next you need to line your baking tray with parchment so that your chocolate decorations are easy to remove once cooled. If you are ok to do the piping free hand then you can let your creative juices flow and get piping. If however you would prefer stencils to help you then use a cookie cutter / google images to help you draw hearts or whatever you want to pipe out onto the parchment – a pencil is fine to use or if you have an edible ink pen that works too. Afterwards you should placed the parchment side that you drew on facing the baking tray – you don’t want to pipe chocolate on top of pencil! Now all you need to do is get piping! After you’re finished carefully place the baking tray into the fridge and leave there to set for 20-30 minutes. 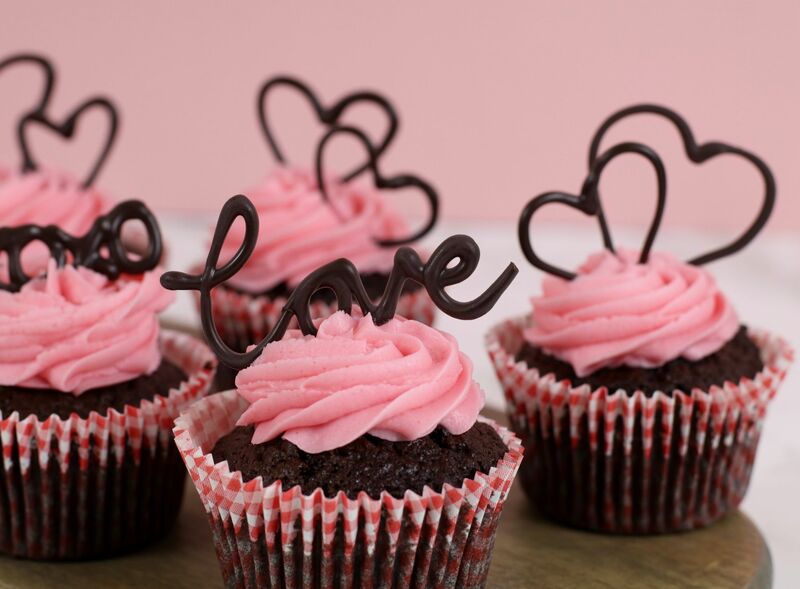 When the chocolate has set you can CAREFULLY remove your designs from the parchment and add them to your cupcakes. Remember though: you don’t want the chocolate to be in your hands for too long otherwise it’ll melt. You can store your cupcakes in a air tight container for a week – even though we both know they won’t last that long! Let me know what you love to make for Valentine’s day.